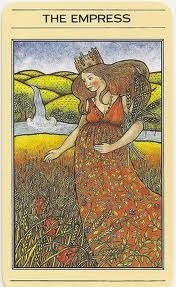 Apple River Tarot Readings - It's Not The Destination, It's The Journey: The Empress - "That's What Makes You Strong"
I've posted this song by the late gentleman of leisure Jesse Winchester because I think it relates to the Major Arcana card I drew today, The Empress. Someone posted Jesse singing this beautiful, touching and truthful song today that I've listened to so many times, and today I made connection between the Empress and Jesse's song. He performed this song, not long before he died, which makes the words even more meaningful and poignant. The Empress, my favourite card, speaks of having an open, trusting heart, of vulnerability and weakness because she loves deeply, opening herself to being disappointed. It truly is what makes her weak but like Jesse says, it is a funny thing but it is what makes her strong, and what gives her power. She is very connected to feelings of safety and trust. The Empress (Demeter) is both the Good Mother, and the Mourning Mother, who knows she is weak, and grieves for her missing child, that she loves and needs, her beloved daughter Persephone. Spring does comes again, and Persephone returns once more, so to do the flowers, as there is new life, in the cycle of nature and life. Souls smile, are moved, and she sings and so do we all. I agree with what you write about the strength of the Empress, but darn it, why is it so difficult in real life? You are so darn right Ellen! Nothin' easy about it!